The week of cake continued last week with this beautiful creation of deliciousness. The original oreo cake recipe was just too complicated and had a million steps and ingredients. I streamlined this recipe by going the semi-homemade way and using a cake mix, which means I only had to make the filling and assemble this tasty monstrosity. The filling is creamy and the oreos are crunchy, which perfectly compliment the rich chocolate flavor and spongy cake. Save yourself some time and frustration and buy a cake mix for this awesome edible. Prepare the cake according to the instructions. Prepare two 8-inch round baking pans with a light coat of oil. Before placing batter into the pans, twist apart enough oreos to line the bottom of one of the cake pans. Divide the batter between the pans and bake as directed. Meanwhile, cut 15 oreos in half and set aside. Crush the remaining oreos. To make the filling, use a stand mixer with the whisk attachment and whisk the cream, sugar and vanilla until creamy. Fold in 1/8 cup of the crushed oreos into the cream. When the cakes are finished, remove and allow to cool completely. To decorate, start with the layers with the oreos, oreo-side up. Cover the oreo layer with the cream filling, then top with the other cake layer. Using a thin coat of the chocolate icing, cover layers with a crumb coat, then chill in the fridge for 15 minutes. Use the remaining icing to coat the outside of the cake. 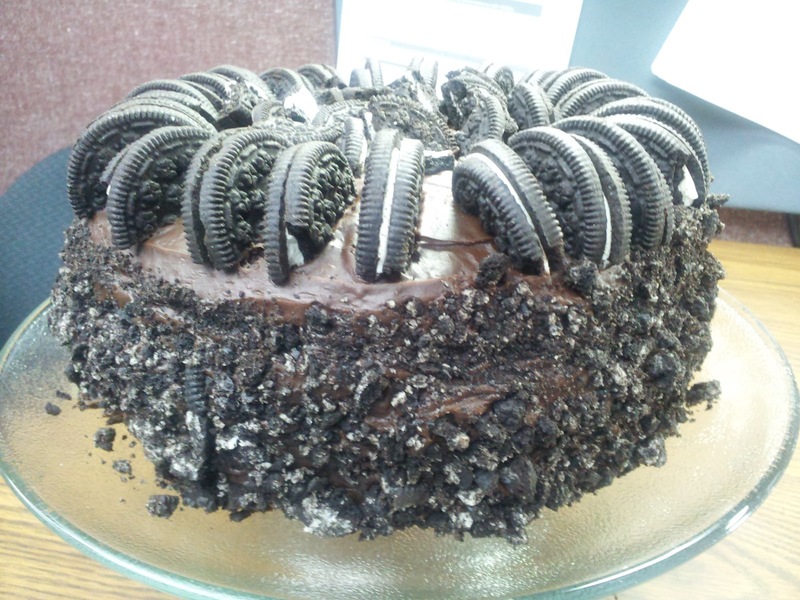 Top with the oreo halves, then use the remaining oreo crumbs to coat the sides of the cake. Check out my other oreo recipes. I really want to make this recepie but can you specify what to do a bit more. thank you! Sure, if you have further questions, just e-mail me at kelly@kellytheculinarian.com and I'm happy to clarify.